The Drama Desk expresses great sadness at today's passing of legendary theatrical and television producer Roy Somlyo following a long illness. "The Drama Desk mourns the loss of Roy Somlyo, consulting producer for the annual Drama Desk Awards ceremony. In addition to being a good friend and a very special person, Roy was of enormous assistance in recent years in helping obtain sponsorship for our annual awards shows and in arranging and editing television productions. His death today is a profound loss both personally and professionally. We salute Roy for his long involvement in the theater and we extend our deepest sympathy to his family." It’s got great songs, a wonderful actress playing Vera and a pretty decently updated book, but the newest version of Pal Joey lets down rather than revives at Broadway’s Studio 54. Stockard Channing stars as Vera Simpson, a married woman smitten with sleazy-but-charming womanizer Joey Evans (Matthew Risch) in 1930s Chicago. The problem here, is that this Joey is neither sleazy nor charming. Risch, originally the understudy, took over the role prior to the show’s opening when Christian Hoff suffered an injury and bowed out amid rumors that the show’s producers didn’t find his dancing skills up to par. Where a triple threat is needed, however, director Joe Mantello inexplicably cast a triple so-so instead, whose singing, dancing and acting skills just aren’t ready for a powerhouse role like Joey. In past stage and screen adaptations of the Rodgers and Hart classic, Joey was played by the likes of Gene Kelley, Bob Fosse and Frank Sinatra. The character mistreats women, but is supposed to have a magnetism they find irresistible. 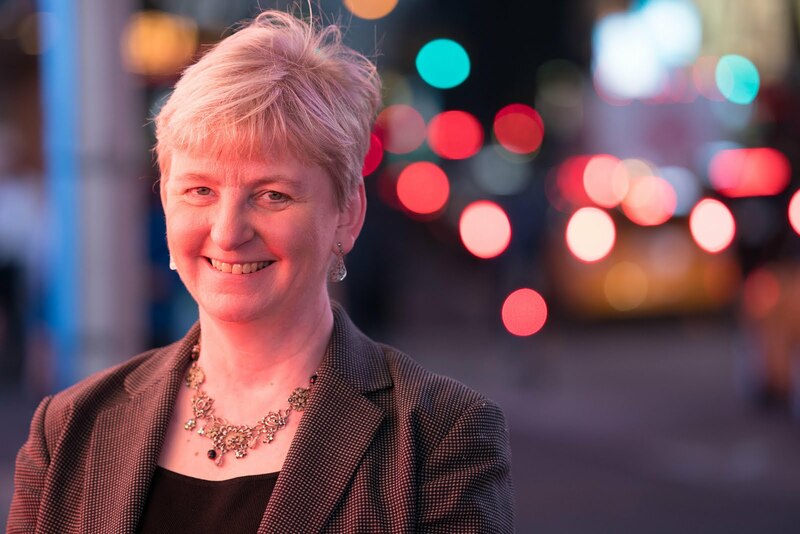 With Risch unable to give Joey any charisma or panache, we’re never quite sure why confident Vera, trustingly naïve shopkeeper Linda English (Jenny Fellner), vampy ex-girlfriend Gladys Bumps (Martha Plimpton in a pleasing turn) or anyone else would be attracted to the cad. Channing brings good stage presence, comedic timing and a few moments of raw emotion to a rejected Vera. You feel her pain when she grabs her drink glass for another round of “fini;” you’re just not clear why she cares so much. When she sings one of the show’s trademark songs “Bewitched, Bothered and Bewildered,” she seems more “concerned” -- about hitting the right notes than any of the above. Channing uses her wonderful drama skills to act through her solos, reminiscent of Glynis Johns talking her way through “Send in the Clowns,” but she doesn’t have adequate vocal coaching support. 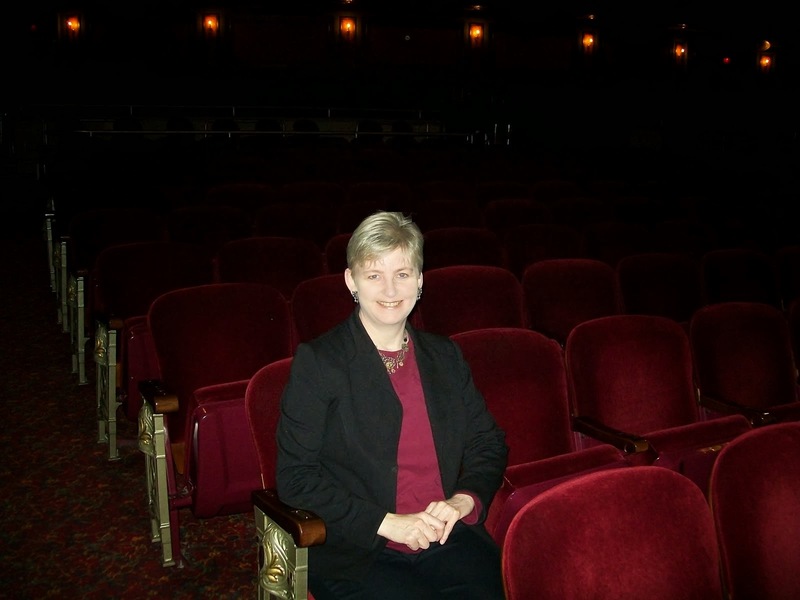 Musical director Paul Gemignani also should have worked more with Plimpton (who has received acting accolades, but for whom music theater on the Broadway stage is a new venture) and Risch who both have trouble finding support for some of their notes. Fellner has the strongest singing voice of the group and Risch’s duets with her are his best vocally. Richard Greenberg’s update of the book by John O’Hara is fresh, combining some of the original characters and shifting song assignments around. The orchestra, split above the stage on both sides, isn’t large, but sounds full. It’s always wonderful to hear Rodgers’s “I Could Write a Book,” “What is a Man” and the haunting “Bewitched, Bothered and Bewildered” which get into your head and keep you humming them for days (the mark of a great Broadway score). Scott Pask’s set design is noteworthy. Two rotating side stages, a tall winding staircase, minimal props and a central section nuanced with scrim and lighting (Paul Gallo) become various locales. William Ivey Long’s costumes evoke the period and Channing is bedecked, if not bewitched, in several lovely sparkling gowns. 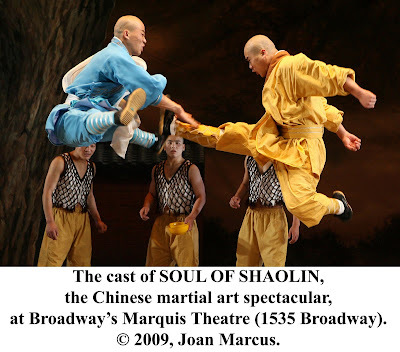 Chinese martial arts performed to music by a cast of 30 bring the first production from the People’s Republic of China to a Broadway stage in Soul of Shaolin, playing at the Marquis Theater through Jan. 31. The story, told entirely through movement, except for a few brief narrations to move the plot along, follows Hui Guang (played at different ages by Yu Fei, Dong Yingbo and Wang Sen), separated from his mother during war when he was a baby, raised by the monks at Saholin temple and trained in the disciplines of martial arts by master Na Luo (Zhang Zhigang). His mother, (played by Wang Yazhi and Li Lin) never gives up searching for her son, carrying with her a piece of broken jade that matches one she left with him for identification. For mother and son to be reunited, Hui Gang must prove his mastery of Kung Fu to leave the temple. 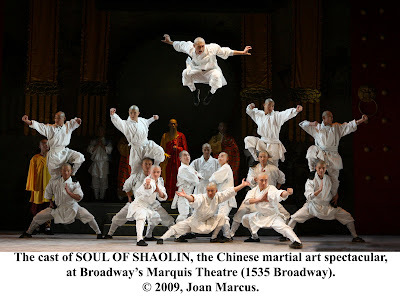 The production, directed and choreographed by Liu Tongbiao isn’t your typical Broadway production. It uses recorded music (by Zhou Chenglong) and sets (Xie Tongmiao) that bring to mind tours for school assemblies, but the action is non-stop with tumbling, rolling performers and noise making weapons amidst demonstrations of special skills, including some flips from head to feet and a man suspended by spears, that are sure to keep children entertained. Huang Gengying designed the colorful costumes and Jiao Hongbo is the chief martial art director. The curtain call is especially thrilling. While publicity information indicates that the show incorporates Buddhist meditation and principles, this isn’t overtly part of the story. It has drama, stars, daring feats, heroes and slick choreography, but it's not a Broadway show. It's the story of a US Airways plane that landed in the Hudson River yesterday minutes after takeoff from La Guardia Airport in New York (and just slightly upriver from my home town). It's the story of quick-thinking pilot Chesley B. Sullenberger III, who decided to head for the water instead of the densely populated areas on the New York and New Jersey shores when his aircraft apparently lost both engines after hitting a flock of birds. Sullenberger's deft piloting of the craft resulted in the survival of all 155 passengers and crew. Passengers in the emergency rows of the plane apparently manned the doors and had them opened within seconds of hitting the water and it appears that the plane's crew conducted one of the fastest and most perfect evacuations ever. I have been responsible for evacuating large numbers of people in emergency situations, so I can tell you it's not as easy as you might think. Meanwhile, ferry and sightseeing boats, in an immediate and marvelously choreographed effort, headed toward the plane and rescued passengers from frigid water and air. Ordinary folks on these boats as well as official rescue boat personnel offered their coats, gave hugs to warm the survivors and offered their cell phones so they could let loved ones know they were all right. New York and the tri-state area is not only home to some of the greatest theater in our country, but to some of the nicest people as well. If you're not from this area, you might scoff, as New Yorkers in particular have a reputation for being unfriendly, but my experience has been that in times of trouble, we've got your back. How ironic that President George W. Bush's first and last messages from the White House should coincide with tragic events involving plane crashes in New York. His first was on Sept. 11, 2001 and there wasn't one New Yorker who saw that low-flying plane yesterday who wasn't transported back to that day for a moment. How exciting, though to see the quick and organized response of rescue, to see people rushing to help others and to feel a surge of pride that Americans like Sullenberger, who apparently went back through the cabin twice personally to make sure everyone was out, can be heroes. Lots of prayers were offered on that plane when it was going down and later by others watching and hearing about the event. I add mine for quick healing for the passengers who were injured and some of praise and thanks for a "miracle on the Hudson." For those of you who might be in the New Haven, CT area, here's a chance to make a difference while enjoying a night at the theater. Long Wharf Theatre will hold a food drive to benefit AIDS Project New Haven during the run of Coming Home, a world premiere by Athol Fugard. AIDS Project New Haven’s Food Pantry is currently experiencing a shortage of many necessities, and Long Wharf Theatre staff and patrons have the opportunity to offer a contribution that may make a difference for many families. Donations will be collected in the Mainstage lobby from Jan. 14 through Feb. 8 and can be dropped off between 10 am and 5 pm and at evenings of performances Tuesdays through Sunday. Suggested items for donation include canned protein items (tuna, chicken, chili, beans, beef stews & chunky soups), canned fruits and vegetables, packaged items (cereal, nonfat dry milk, oatmeal, trail mix, granola, ramen noodles, stuffing mixes, and condiments such as salad dressings, gravy, and mayo); low-salt, healthy varieties are encouraged. 99 percent of people who use the Food Pantry are living in extreme poverty, in addition to facing chronic illness, juggling multiple doctors’ appointments, and often have few resources to feed themselves or their families. According to a Connecticut Food Bank survey of pantry clients, 42 percent had to choose between paying for food or utilities, 34 percent had to choose between food and paying rent and 30 percent had to choose between food and medical care. For more information or to purchase tickets, call 203-787-4282 or visit www.longwharf.org. In addition, A Yale University pediatric doctor and a documentary filmmaker will join together to discuss the scourge of AIDS in South Africa in the upcoming installment of the Long Wharf Theatre’s Symposium series. 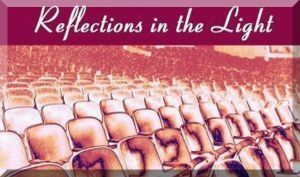 The symposium, entitled “The big disease with the little name: South Africa, AIDS, and the healing power of stories,” will take place on Sunday, Feb. 1 following the 2pm matinee on Long Wharf Theatre’s Mainstage. Dr. Brian Forsyth is professor of pediatrics and Yale Child Study Center at Yale University. He has provided clinical care to children with AIDS from the beginning of the epidemic in the U.S. and since 2002 has been conducting HIV-related research in South Africa. He is the principal investigator of a study in South Africa funded by the U.S. government to examine the effects of a support intervention aimed at building resilience among young children of HIV-infected mothers in South Africa. The question of plagiarism and theft of intellectual property is one that keeps coming up. Churches and Christians are some of the worst offenders, I find, though I am certain Jesus would not be happy about us cutting corners or ignoring what is right. To make sure you're complying with the law, and to make sure that you are using other people's works with integrity, take our workshop on copyright law for churches to find out how and when you can use someone else's work (http://masterworkproductions.homestead.com/workshops.html). Most of the time it's very easy and inexpensive to do what is right. If you're not sure, here's a good guideline: pretty much if you didn't create it, you can't use it in print, online, in a church service, at youth group night, in the church bulletin, at bible study or because your event is free or nonprofit or anywhere else unless you have permission. "Black Sunday" as last Sunday has come to be known in theater circles, saw the closing of a number of Broadway shows including 13, Boeing, Boeing, Dividing the Estate, Grease, Hairspray, Irving Berlin's White Christmas, Slava's Snowshow and Young Frankenstein. In addition, Gypsy, Spamalot, All My Sons and Spring Awakening will close this month. Some had been scheduled to finish their runs; others, facing a tough economy, posted closing notices. January and February usually are slow periods for Broadway. Some producers have put together some deals to make theater affordable during this time to entice theatergoers to fill seats. The "20 at 20" program offers $20 tickets to more than 20 participating off-Broadway shows at 20 minutes before the curtain. In addition, folks who see seven of the shows receive a free dinner. 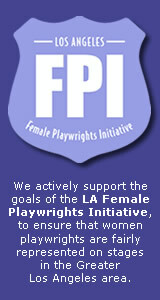 The program runs Jan. 26- Feb. 8. For details, go to http://www.20at20.com. Disney Theatricals also had offered a brief sale that offered free children's tickets with the purchase of adult tickets for The Little Mermaid; The Lion King and Mary Poppins. Some shows have gone dark, but others wait in the wings with openings scheduled this month for Hedda Gabler, starring Mary-Louise Parker and Michael Cerveris, which begins previews today; Soul of Shaolin, a martial arts musical from China playing a limited run with previews beginning Jan. 13; The American Plan with Mercedes Ruehl, already in previews; and You're Welcome America. A Final Night with George W. Bush starring comedian Will Ferrell opening previews Jan. 20. Other shows, some with with star power, will open by the beginning of April including The Story of My Life; 33 Variations, starring Jane Fonda; Blithe Spirit with Christine Ebersole, Rupert Everett and Angela Lansbury, Guys and Dolls with Oliver Platt among others; and Impressionism starring Joan Allen, Jeremy Irons and Marsha Mason. Also on tap are West Side Story, Hair; Irena's Vow and Reasons to be Pretty. Meanwhile, James Barbour's popular concert at Sardi's has been extended. The star of A Tale of Two Cities will morph his holiday offering into a concert of love songs on Saturdays Jan. 31, Feb. 7, Feb. 14, Feb. 21 and Feb. 28 as well as Friday, Feb. 13 and Sunday Feb. 15 to extend Valentine's Day celebrations. Dinner is at 8:30pm with the concert at 9:30pm at Sardi's, Tickets may be purchased by calling 212-868-4444 or by visiting www.SmartTix.com.